There is a lot of detailed planning that goes into throwing a good birthday party. That kind of pressure can easily make stress your unwanted sidekick. If you’re looking for a simpler, more streamlined approach to this difficult task, we’ve outlined everything from the planning stages right up to that big day for you. The guidelines below guarantee you surefire birthday party success that is parent- and kid-approved. Day Of: Set Up Food, Final Walk Through, Party Time! Hash it out. This is the time where most of the outline for the party is decided on and planned. That means choosing a theme, a date and time, choosing the location, a budget, creating a guest list, hiring any entertainment or a photographers and ordering your invitations. This may seem like a lot to do so soon, but giving your vendors and yourself this much notice will set you up for success later down the line. Make or buy? It is now time to plan your menu and party decor. Once you know what food you’ll need you can start to think about what caterers to choose. And as for the decor, you’ll want ample time to decide if you’ll have to make or buy decorations. You’ll want to know what fits into your budget and what doesn’t. It’s always a good idea to make sure you have enough time to order anything that will have to be shipped. Get ahead of the game. Order any food and/or the birthday cake at this time. Your caterer and cake designer will need the next four weeks to create a staffing schedule to be able to handle your large food order as well as purchase the necessary ingredients. Also, if they are already busy, you will want to make sure you get in sooner than later. Otherwise, they may have to turn you down and you’ll be stuck scrambling for other caterers last minute. On that same token, rent any tables or chairs you may need. They tend to book quickly. Fill out and mail all your invitations by this deadline. Too early, and people will tend to forget about the party. Too late, and they won’t be available. Three weeks is the sweet spot for a birthday party. Before you take a trip to the store, you need to plan what you’ll be buying. So take inventory of all the party decorations you already have that match the theme you’ve chosen. Any other decorations you need should be borrowed or bought at this time. There’s nothing worse than scrambling for that one last piece of the puzzle you’ve envisioned the day before the party and no store has it in stock. Next you’ll want to decide which games will be played at the party. Buy any supplies or props you may need for them while you’re out shopping for the decorations. On that note, determine the favors or goodie bags you will want to give out and purchase what you will need for them during this trip, too. This will make your shopping very efficient and make it much easier for you when you need to prepare or set up for the party. If you have anything you’ll be printing off of the computer for decorations, you’re going to want to make sure you have enough paper and ink. If not, you can even plan to purchase that while you’re out on your shopping trip. 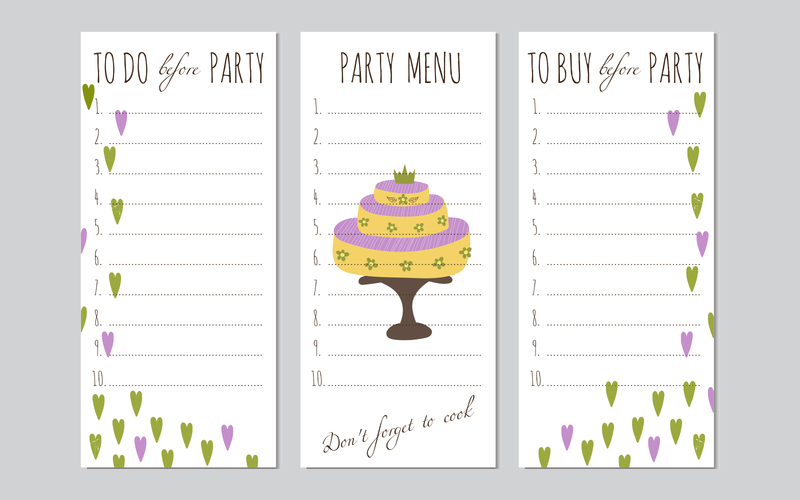 Print and put together any printables you need for the party. That way, if you hit a snag or run out of supplies you can have enough time to get more. And on top of everything else going on from now until the party, you won’t want to be worried about these. Keep the food in mind. Make a run to the grocery store to buy all non-perishable food and drink items for the party. Set them out of the way where they won’t get too hot or too cold, but have easy access to them when you need them. If you are making your cake, rather than having it made for you, bake it, but don’t put it together. Freeze the cake pieces until closer to the party so its fresher. Prepare all the goodie bags using the supplies you’ve already purchased. Call the cake designer, caterer, entertainment, rental company, and photographer, and confirm the details of their service, arrival or pick up time, final payment requirements, and any other relevant information. You will want to make sure you are all on the same page and there are no surprises the day of the party. This is a great way to reduce your stress and to avoid mistakes, delays, or misunderstandings on the day of the party. Write out a detailed or rough outline of the party: guest arrival time, games or activities, eating time, cake, presents, etc. Then, call any guests that have not yet RSVPed. Collect a final headcount for the party so that you can relay the count to the caterer, rental company and make sure that you have enough goodie bags, food or cake (if you plan to make either yourself), etc. for everyone. Perform a test run of what the tablescapes will look like. You won’t want to get caught the day of the party without the right tools to execute the vision you’re hoping to achieve. If there is something you’re missing, wait until tomorrow to purchase it, because you’ll need to buy a few more things tomorrow anyway and this will save you a trip. Purchase any perishable food items you need now. They won’t go bad before the birthday party date and you won’t have to worry about all the space they take up for longer than two days. Also, make sure to take a list of anything else you need that you’ve forgotten to get until now. You won’t have the time or the patience to make another trip between now and the party. Clean any area of your house your guests will see. Purchase extra toilet paper and make sure to have extra clean towels available. Make sure your camera is charged and there is enough space on your memory card to take pictures of your birthday kid and their guests freely. Even if you have a photographer, you will want to have your camera as backup. Prepare any food that must be refrigerated but can easily hold overnight. That way you can just set it and forget it on the big day. Then, defrost your frozen cake pieces. You’ll want to assemble it tomorrow when its room temperature. Put any drinks you’ve purchased in the refrigerator so they will be cold by go time. The last thing for the day is to set up the tables and their tablescapes so that tomorrow you will only be worried about setting out the food. Complete the tables by laying out decorations and goodie bags and setting up all games and activities. Five hours beforehand, prepare any last minute foods, set out the desserts on the dessert table, buy the ice and any balloons you may need. Four hours beforehand assemble the cake, or pick up the cake if it isn’t being delivered, and set the food out on the appropriate table (anything that doesn’t need to be refrigerated). Three hours beforehand put up any last minute decorations and set up last minute activities and games. One hour beforehand reheat any food that needs to be served hot and keep it to temperature. Twenty minutes beforehand toss the salad and set out any cold food items on ice. Then, greet guests and prepare appropriate responses for all the compliments you’re going to receive on your job well done! If all of this seems like a major hassle, we have a one-step process party process just for you. Pick your party and book. I know how it gets a week before the party. Its total chaos. The kid is more concerned about the reputation he is going to carry all year round for this one day and the parents are all out to give their best show.